Welcome to your Candis Club Benefits! 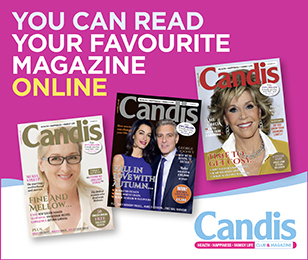 Candis subscribers are also members of Candis club. This very special Club has donated over £55.5 million to health charities since it began in 1962 and continues to make donations each year. Read more about the Candis Club Constitution. We promise to save you time and money with Candis Club’s exclusive range of benefits below, backed by our £30 Price Promise Guarantee. Read more about the Candis Price Promise. Prime Fifty have formulated and tailored supplements to combat nutrient deficiencies in the over 50’s and support the health and wellbeing of those in their senior years.